Prestolite replacement alternators are manufactured for many different types of vehicles. Prestolite has certain alternators for school buses, transit buses, military vehicles, fire trucks, ambulances, and more types of heavy duty vehicles. Like other heavy duty alternators manufactured by similar companies, these heavy duty alternators do their job well, providing a high output with the ability to stand heavy electrical loads. Heavy duty vehicles require a high output alternator because of a) how much time they spend at idle, and b) the electrical usage while the vehicle is at idle. Different components, like lights, lifts, and medical equipment within these heavy duty vehicles use a lot of power, and require an alternator that can withstand it. Prestolite replacement alternators recently include a brushless model, a brushless 160 or 185 amp 12-volt model, specifically designed to withstand temperatures of up to 100 degrees Celsius. However, just like other heavy duty alternators on the market, it doesn’t solve the high output/high RPM problem. 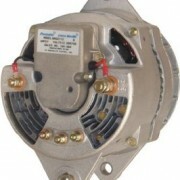 While these heavy duty alternators are reliable and durable, they also cause high RPM. 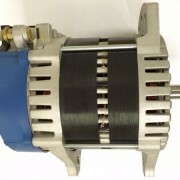 An Eco-Tech alternator features patented magnet technology that allows for a high output, low RPM alternator. What does this solve? An engine consistently at high RPM will wear out more quickly, and will need more maintenance. High output/high RPM also takes a toll on the battery, and the alternator itself. A high output, low RPM alternator, such as Eco-Tech’s models, also eliminates the need for extra components, such as high idle devices or load shedding devices. In addition to being environmentally friendly, an Eco-Tech alternator also eliminates the fuel penalty experienced at high idle, saving thousands of dollars a year on fuel. For the best in efficiency and cost-cutting without cutting performance, choose an Eco-Tech alternator today for all types of heavy duty vehicles.